Changes: Notes + GPG Sig. Espionage: simple, state of the art encryption and plausible deniability for your data. 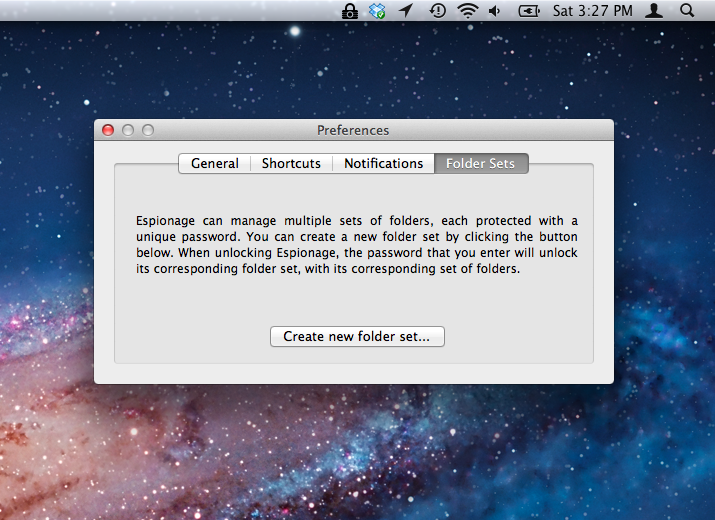 Espionage 3 protects you even if you're forced to give up your master password by giving you the ability to have multiple master passwords, each protecting an isolated set of folders. Every protected folder can also advertise completely different data, depending on whether it's locked or unlocked. Of course, that's not to say we skimped on the encryption. Espionage 3 is the most secure Espionage yet, featuring AES-256 encryption by default, and scrypt to protect your passwords from even the most powerful of adversaries. 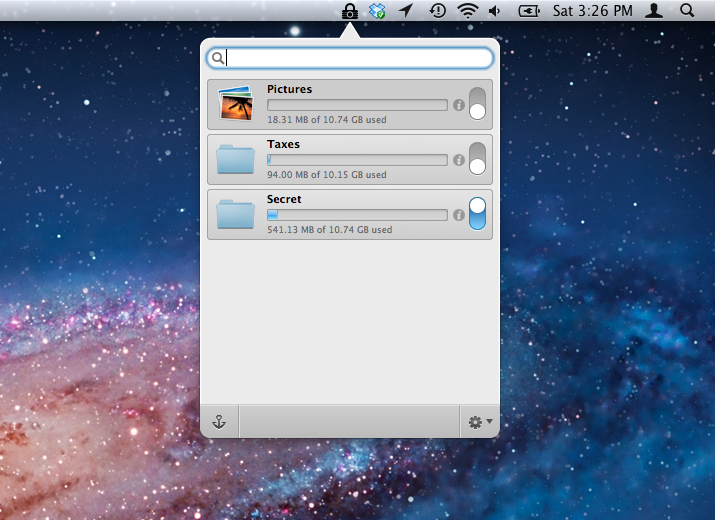 Protect individual folders and easily access them from the menubar. Settings like auto-lock and maintainence of the encrypted data at your fingertips. Espionage offers the state of the art in Plausible Deniability. Encrypting your email doesn't have to be a pain. → Watch how to do it. Espionage + FileVault = multiple layers of encryption. Or, turn off FileVault to use Espionage with laptop theft tracking software (we recommend Undercover). Built to work great with Spotlight search. 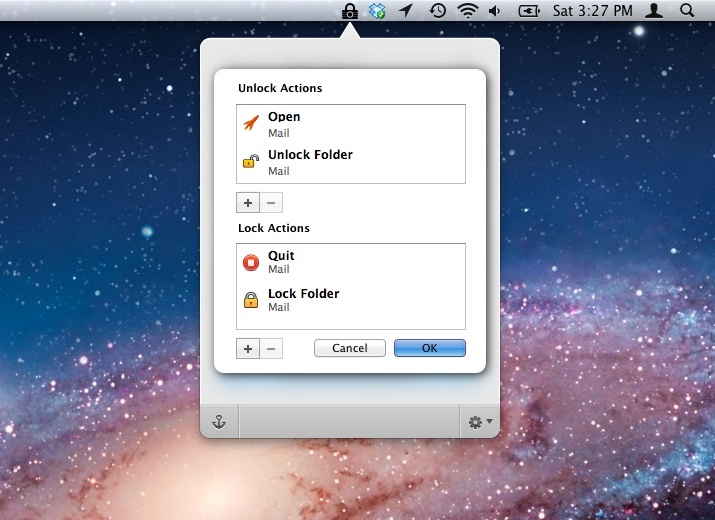 Folder contents only show up while the folder is unlocked, and you can prevent that too if you want! We know that for software to provide any meaningful security guarantees, its source code must be available to third-parties for inspection. We also recognize that releasing Espionage's source code can hurt Espionage and its users because of software piracy. We want to continue giving you stellar customer support and timely updates, so we follow a middle-path by giving security experts access to Espionage's code so that they can verify its security. We're also allowing them to distribute unmodified copies of Espionage that they've built themselves, so that anyone who doesn't trust our copy can download it from them. Apply here. Designed to work efficiently with third-party backup software like Time Machine and online-backup services like Dropbox.